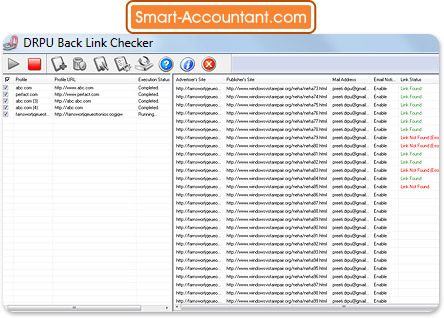 Introduction- Backlink Checker Utility is the best solution to check user websites backlink status in real time. Web link checking utility automatically checks the back links of advertiser websites to the publisher. Link checker tool alerts user by sending an e-mail notification at user specified e-mail address if advertiser website link not found on publisher site or backlink removed from the publisher site. Award winning software assist users to detect java script link, reciprocal advertiser website link, direct link or other link on publisher’s websites. Data Doctor’s Back Link checker detects the website link status and generates backlink status report in TXT or HTML format for determining the website popularity over the internet or other browsers. Web Link analyzer enables to analyze the backlinks which are responsible for the websites popularity. Easy to use and cost effective software utility is helpful to increase e-business growth and does not require any special skill to operate. • Monitor the backlink status of the user websites in real time. • Check advertiser site’s back link status to the publisher sites. • Send e-mail notification to user if website link not found or link removed from publisher websites. • Generate the backlinks status report in txt or html file format for further use. • Enable to check website performance in real time. • Detect java link, website link, reciprocal links and other links on publisher websites. • Highly interactive user friendly interface. • Provide in built help menu for user’s assist.